With generous support from the Society of Architectural Historians’ American Architecture and Landscape Field Trip Grant Program, the Frank Lloyd Wright Trust is excited to announce Connecting to Robie House beginning in Fall 2019. 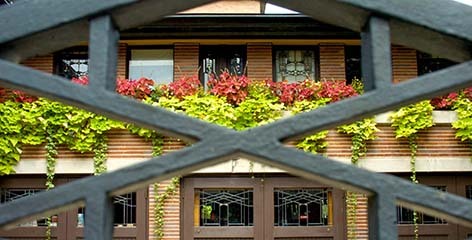 Connecting to Robie House includes free tours of the newly restored Robie House in Hyde Park and design-based workshops in the classroom. Each tour includes sketching and looking activities to help students explore Wright’s design legacy. Classroom workshop themes include geometry, nature, and Organic Design. All Chicago Public Schools are eligible. Reservations are limited to 60 students each day. To make a reservation, please complete the online form. For more information contact the education department at 708.725.3828 or email educate@flwright.org. Support Trust education programs and donate! Contributions to education at the Trust support free year-round youth and family programs, discounted student tours, free professional development for teachers, low-cost classroom workshops across the Chicago area, and free online resources at teachingbydesign.org. $5 donation is the tour admission for a student, and $150 provides a free workshop with all supplies for an underserved school.